Reuters and other news sources announced late last night, HERE, that the California Public Employees' Retirement System (CalPERS), the biggest U.S. public pension fund, reported a 12.5% return on assets over the 12 months ending June 30th. This is great news for most California municipalities, including Costa Mesa, since the pension burden has driven several cities to declare bankruptcy in recent months. In fact, Costa Mesa's Pension Oversight Committee recently had a two-part Municipal Bankruptcy primer presented by member Rick Kapko to familiarize that group with the process. Hopefully, our elected leaders will ramp down the rhetoric about our unfunded liability just a little and move forward with fiscally sound and prudent policies to manage our city finances. I suspect this announcement might get some play at the Costa Mesa City Council meeting tonight.. we'll see. sandy said this first for Weitzberg's name being picked out of a hat but just had to borrow it, so original and all). After years of underperformance putting us behind the eight ball for billions of dollars in unfunded pension promises, they make some money! now just don't raise pension formulas based on a year. CalPers is the largest public retirement fund in the United States. Righeimers plan of waiting until it implodes and goes bankrupt is another attempt at politicizing something that he personally doesn't like or agrees with. Sadly, he will hurt the city further, to move his own agenda, based on trumped up rhetoric and while ignoring verifiable facts or sound professional counsel. That's just how we roll here in Costa Mesa. It is hard to explain somethign to people who do nto understand and desperately want others to fail. West neglects 1% return prior year and any and all other guidance from experts that there is an issue. They and others ignore all that. Just like Nick Bernadino's OP Ed in the Register today. 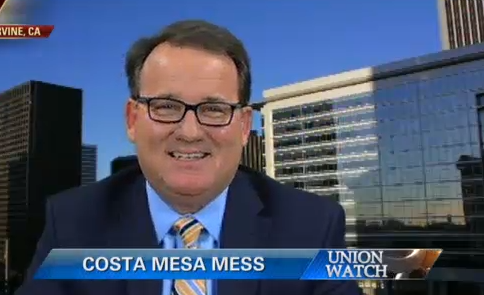 Costa Mesa is facing a mandated 50% increase in pension contributions. That means we as taxpayers will have more of our tax dollars go to pay for pensions instead of parks and roads. These folks want us to believe Stavely as an expert but reject any and all other experts that vary from their dogma. OC Register also has a front page article on the fact that the Feds are withholding county funding because the very small pension reforms put in place may not, according to union bosses, have taken into account collective bargaining. Ggo Riggy Do Not Stop......Your boy ignores all experts except his bosses at the OCGOP. He ignored the taxpayer funded consultant/expert on CMPD staffing levels at the same time he ignored Staveley. Remember that? As for PERS, they have always maintained, I believe, an annual (read average of all years) rate of return of around 7.5% to sustain the pension fund. Last years 1% plus this years 12.5% divided by 2 equals an annual return over the last 2 years of 6.75%. Pretty close. This is why cops should be cops and not politicians nor math majors. If we start with 100 and have a 50 % reduction = 50. And then I have a 50 % increase it is not 100 but = 75. One of many examples of flawed cop logic. They opened the dive bar early and gave the phony "Family Man" his laptop back. Well, entries are all 15 to 45 minutes long, and it must take him at least that long to down a cold one and compose his thoughts. You guys are about as sharp the edge of town. Any person with any sense of numbers realizes averages and percentages are reflections of real numbers, usually to make things easier to understand, although they appear in this case to make things more difficult for you guys to understand. I love how you guys take a positive and do everything in your power to try to make it a negative. So let's say CALPERS invested the $100 of which you speak. The return last year means CALPERS now has $112.50 in its account. So if CALPERS re-invests that money and gets its target of 7.5% rate of return for the next year, it would have around $121 in that account. Again, reflections of real numbers. I don't understand the logic that says signs of a recovering economy is bad for Costa Mesa. A healthy pension fund is good for everyone, including Costa Mesa. Especially business in Costa Mesa. The OCGOP plan to own everything in the city and do away with the protection provided by being part of California is fine for a few, but not the rest of us. We know historically that a healthy pension fund helps the community as a whole. And doing away with it, will hurt far more than it helps – save the OCGOP and all who sail in her. If Riggy and the other members of the council are so worried about pensions how come they chose to accept only 5% from the fire department towards pensions when the fire department offered up 10%? Seems like an easy way to get your employees to pay more. Yes, let's all follow Riggy's lead on this topic. There can never be any good news on the ole' pension front. A whopping 200 million + is owed on these damn pensions. If that pesky union would only stop preventing us from outsourcing everything not nailed down, then we could simply erase this debt. Oh wait, the city's pension consultant, Mr Bartell, stated the 200 mill would have to be paid back within the next 10 years. And, we would have to pay the new replacement employees as well. After having just written all of this down, it just doesn't make sense! In fact, it makes as much sense to hire those private jailers, while continuing to employ the former incumbents at their current pay. Let's leave critical decisions regarding fiscal policy to a future council majority which may be up to the challenge. Some of you may have seen a comment here by someone posting as "Selective Math is bad!" which, inaccurately, mentioned an "Arnell bankruptcy". To the best of my knowledge there has never been a bankruptcy involving Mensinger's former employer, Arnel, so I deleted it. Do me a favor, OK? At least TRY to get the facts right... Geez! SunCal bankruptcy would have been accurate. Most investors got stiffed, yet Righeimer and Mensinger got fat pay outs. Hmmm.